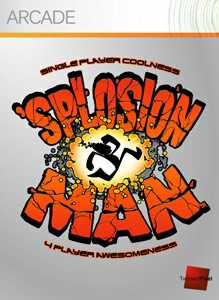 The Deal of the week is Splosion Man from Twisted Pixel. This great game which was released during the summer of arcade will be 400 points, half off the original 800 price point. For new releases, we get Chime, a new puzzle and word game which will be 400 points when it arrives Wednesday. More details await you below! "An exclusive Zoë Mode production for OneBigGame, the video game industry-wide charity initiative, Chime pits gamers against the melody in this all-new puzzle experience. Place blocks against the clock and remix famous artists’ music tracks in this challenging and addictive puzzle game. More than 60 percent of the purchase price of Chime will be donated to children's charities around the world, helping those who need it the most."